The Nutrition Science major provides a foundation to pursue careers that improve lives, prevent diseases, promote health, and make a difference. What you eat not only has the ability to promote health, it also influences your risk of many diseases. Students who major in Nutrition Science develop a knowledge base in science and nutrition to understand and explore the relationship between what we eat and health. Courses specific to this major emphasize the fundamentals of nutrition, the metabolism of nutrients in health and disease, and nutrition science research. Undergraduate students have the opportunity to pursue research opportunities in various areas - including cancer, muscle health, obesity and diabetes. With a focus on nutrition and preventive health, Nutrition Science offers excellent preparation for students pursuing graduate and professional school – especially students wanting to become physicians, physician assistants, physical therapists, occupational therapists and dentists. All of the pre-requisite courses for medical school are contained within the planned program. Students may also want to double major in Nutrition and Dietetics or Nutrition, Fitness and Health. Students in Nutrition Science also have the opportunity to complete a five-year accelerated Master of Public Health (MPH) degree, potentially saving one full year of tuition and adding an extra year in the workforce. Watch these videos to learn more about the Department of Nutrition Science. 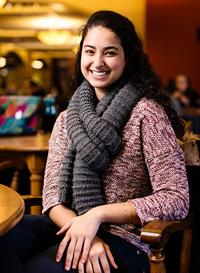 Tell us why you chose Purdue University for your undergraduate education. When I was applying to college, I wanted to be part of a big community. I was looking for a university that would offer me unimaginable opportunities as well as the chance to interact with people from all over the world. Purdue is a very diverse campus, and its diversity brings so much to the table. I have met people from many different backgrounds, and this has helped me grow in my awareness of different cultures. HELPFUL! During my time at Purdue, I have never had an unpleasant encounter with any HSS faculty and staff. They have all been very friendly and seemed to genuinely care about me. Come to Purdue with an open mind. It is hard to name only one thing. I really love the campus and the many research opportunities Purdue offers its students. Also: Completion of at least one semester of college-level chemistry or biology with a grade of C or higher. Nutrition Science is excellent for pursuing pre-medicine, pre-dentistry, pre-physical therapy, pre-physician assistant, pre-optometry, pre-veterinary medicine, pre-public health, pre-law, and graduate school. With a bachelor's degree, students pursue careers that promote health through research, communication, sales, and/or service. Examples include working in a university, industry (food, agricultural, pharmaceutical), government agency or nonprofit organization.